axiUm is the most popular dental practice management system for dental universities in North America, with an estimated 80+% of dental institutions using the system. Though the system gets the job done, users find the interface to be dated, and the system to be a bit clunky. Not popular outside of academic settings, so students will likely have to learn a new system when they begin working. Used by well-known dental universities, including UCLA, NYU, Penn, Stony Brook, and many others, axiUm is the most popular dental practice management system in dental institutions across North America. The system was developed by Exan, which was acquired by Henry Schein (which also owns Dentrix and Easy Dental) in 2012. Since its acquisition, axiUm still continues to acquire new clients (both UCLA and Penn have transitioned to axiUm within the past year). With such a strong client base, axiUm has all of the functionality required to support the needs of educational institutions. However, many users find the user interface to be dated, and clunky to use. The system comes with a bit of a learning curve, but once users familiarize themselves with the system, they tend to find it intuitive, and are able to accomplish everything that they need. The system is Windows-based, and as you can see, has the look and feel of the Windows desktop. 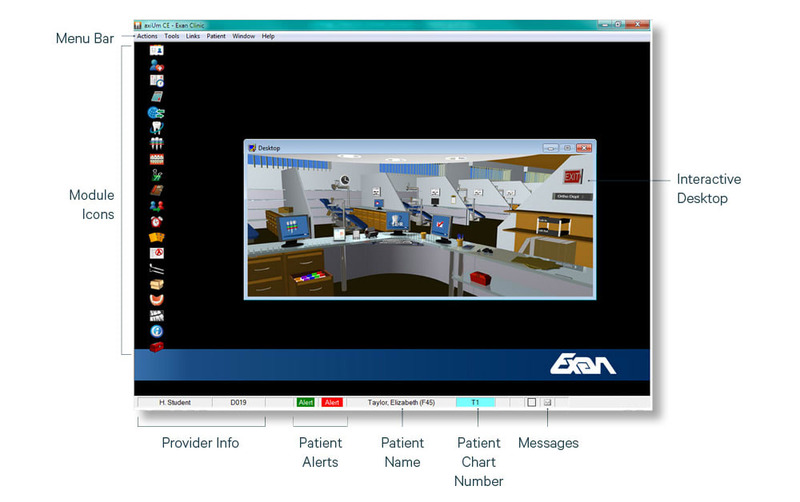 Each module can be accessed either through the left panel, or through the optional interactive desktop in the middle of the screen. When you open a new module, it opens a new window, which makes it easy to have multiple modules open at the same time, so that you can access all patient information quickly. Universities typically host axiUm on their own Windows servers, and have students connect through a virtual machine, or remotely through a VPN (Virtual Private Network), which enables students to use the software on their own personal computers. This also means that students can access the system using both Windows and Mac machines, even though the system is only compatible with Windows operating systems. However due to HIPAA restrictions, some universities restrict certain information from being accessed through VPN. axiUm has all of the basic functionality that you'd expect from a dental practice management system, including scheduling, EHR, dental charting, insurance coverage, and treatment planning. Since axiUm is primarily marketed toward universities, we'll focus the rest of our review on the academic-specific functionality that makes axiUm more appropriate for universities than traditional dental practice management systems. One of the main features for academic settings is the ability for instructors to sign off on students' clinical work. When students treat patients, all of their work must be signed off by the instructor. After the instructor reviews the student's work done in clinic, they can then swipe their card through the card reader, which shows approval of the student's work, and registers the approval in the system. Another benefit of axiUm for dental universities is that the system enables you to create courses and track student grades, as well as clinical performance. This is all integrated with the rest of the system, which prevents universities from having to use separate systems for creating coursework, and for tracking student grades. Because they are able to access student grades and clinical performance from one system, instructors can have a cohesive understanding of how the student is performing, and can give better personalized advice for the student. The instructor can also easily identify students who are struggling. Or, if an entire class seems to be struggling with a concept, this can help instructors understand that they need to modify their coursework accordingly. axiUm includes a module known as axiUm Messenger, which enables users to send messages to other students and faculty. This is especially convenient when communicating information about patients, since it doesn't require any external services in order to share patient information. You can also specify the priority of messages, which are conveyed to the recipient by color. If the message is marked as high priority, the message icon in the recipient's desktop toolbar will be red -- otherwise a new unread message will result in a blue message icon. There are two main components to axiUm's security. First, the system includes an audit history for users, so that you can easily understand what changes were made, and when they were made. This is particularly helpful for instructors who are auditing student work, and who want to be able to understand a student's workflow for a particular patient. If any mistakes are made, it's easy to identify who made the changes, and revert them if necessary. axiUm also allows administrators to create various security profiles for different users, so that they can only access certain information. This helps limit the unnecessary spreading of sensitive information. axiUm has all of the functionality you'd expect from any dental practice management system, including charting, scheduling, treatment planning, and EHR. However, the system also has many academic-specific features that make it appropriate for dental universities. Features like clinical evaluations that enable instructors to sign off on student work, as well as integrating the system with coursework, make the system more suitable for academic settings than traditional practice management systems that are designed for private practices. Though the user interface is somewhat dated, the system is widely used across dental universities in North America, and is a safe option for any academic dental institution to consider. To learn more about axiUm, you can visit their site here. You can also read our interview with Michael Trieu, third-year dental student at the UCLA College of Dentistry, to learn about how he uses axiUm for his clinical work, and what he thinks about the software.